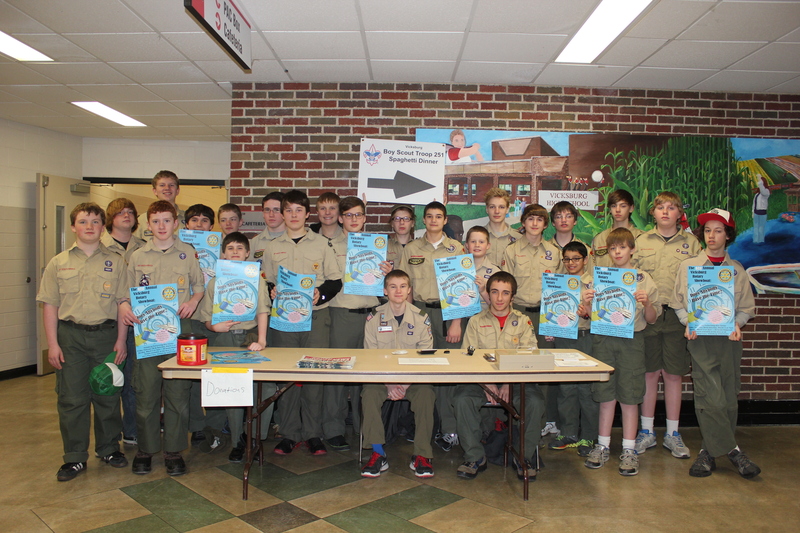 Vicksburg Boy Scouts Troop 251 sell tickets for spaghetti dinner and Showboat combo ticket. The 62nd Vicksburg Rotary Club Showboat is right around the bend with performances scheduled for Friday and Saturday, February 27 and 28, at 7 p.m. A matinee on Sunday, March 1 is set for 2 p.m.
For folks who would like to dine on spaghetti and meatballs, Boy Scout Troop 251 is offering a fabulous opportunity to enjoy dinner and the show on the first two nights of the show, beginning at 5 p.m. in the Vicksburg High School cafeteria. This is the second year for a combination dinner and Showboat ticket to be offered by the scouts and the sponsoring Rotary club. 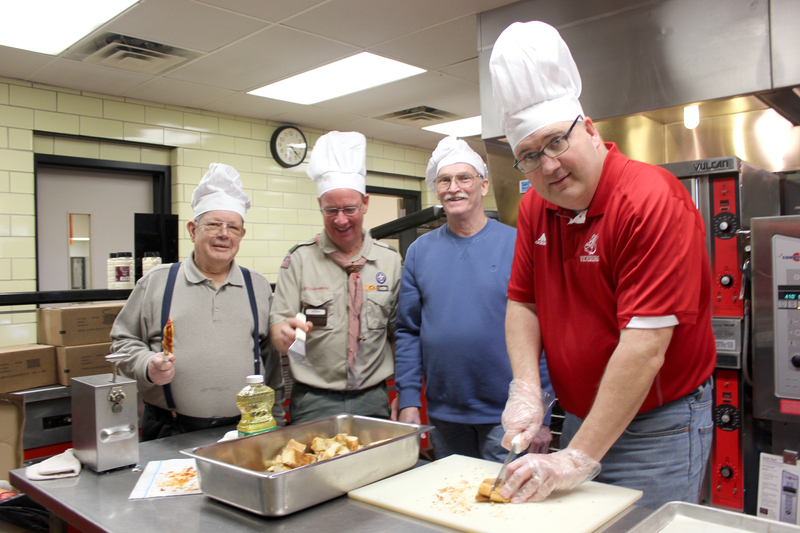 The scouts have been staging a spaghetti dinner for several years and have their team of epicurean chefs preparing the food under the auspices of Jim Butler in the kitchen and Dan Gettle as head of the organizing committee. Troop 251 will be celebrating its 75th anniversary in 2015, beginning with the spaghetti dinner, with other events planned throughout the year. They were actually chartered in 1917 but saw its charter lapse and be reinstated in 1939. They have been in business ever since, helping to implant the moral and ethical values they espouse in Vicksburg area young people, according to Kevin Borden, the current scoutmaster. The troop’s numbers have been growing steadily with twelve scouts in the various stages of the challenging process to become Eagle scouts. “Scouting is a way of life,” Borden says as he believes he and the other adult leaders are building future citizens. Ken Heikes, Dan Gettle, Jim Butler, and Don Anstead, support the Boy Scouts’ spaghetti dinner as the kitchen help. The combo ticket is a fundraiser for the scouts and the Rotary Club in this partnership. It provides $2 off the price of the regular ticket, plus a $1 reduction in the meal cost, for a total of $15 for dinner and the show, according to ticket chairperson Steve Goss. For kids less than 14 years of age, the dinner/show combo is $12 and for those who want just the dinner it is $8. For kids 14 and younger without the show, it’s $5 and those under five years of age, it’s free. Tickets will be available at Hill’s Pharmacy several weeks before the show by calling 649-1476 or stopping in at their Main Street store in Vicksburg. Walk-ins the night of the shows will be able to purchase the combo tickets or either the dinner or show at full-price. Crowds gather for the chili cook-off the last time it was held in Vicksburg in 2013. The Vicksburg Chamber of Commerce has decided to resurrect the Chili Cook-off that it held for over five years in the village after a one-year hiatus. It was very popular, but a lot of work, says Tanya DeLong, the president of the Chamber Board of Directors. It is set for Saturday, February 7, from 11 a.m. to 5 p.m., just as the Frostbite Run sprints into action at 11 a.m., from a huge tent that will be set up at the corner of W. Prairie and Michigan Ave. This fun run has been on-going since Ann Maltby and her family started it in 2009. For the first time, runners will be able to get ready in the heated tent and end up back in the same, according to Jonathan Langworthy, the race director for the last two years. “We’ve moved up the time of the race to 11 a.m. to coincide with the Chamber’s event, not to mention the opportunity to keep a bit warmer,” he said. Registration can take place online before Friday, Feb. 6, then at race headquarters on Saturday morning. After the race, runners will be fed and those watching and cheering can choose a can of beer or pop to go with their samples of chili, according to DeLong. Vicksburg area restaurants will vie for prizes, from fan favorite to the juried prize for best individual chili. 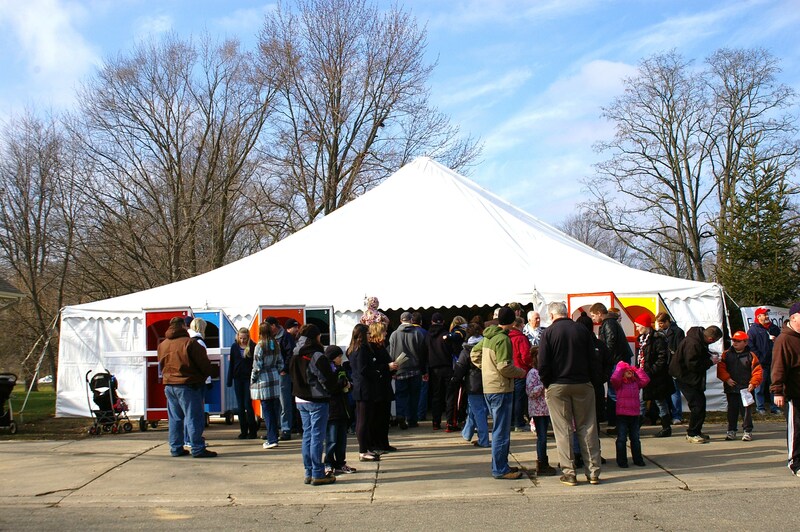 The tent holds about 450 people at any given time, so the Chamber planners have decided to keep things going several hours into the afternoon before closing down and announcing the prize winners at about 5 p.m. This pooch entrant in the Frostbite Run was used to the cold. Frostbite runners leave the start gate in 2014 at the Recreation Trail. Jonathan Langworthy, the race director. The season of giving that most of us just experienced during the holidays actually extends throughout the year. Our communities are fortunate to have the caring people who volunteer to keep the nonprofits doing their magic. This list begins with the Vicksburg Foundation board, which recently announced nearly $250,000 in grants made to 501c3 organizations in south Kalamazoo County. Just for the record, Frederick Construction has made a nice donation to the Vicksburg Community Schools Foundation (VCSF). A more visible donation was when he quietly talked to Ken Evensen, the leader of the Thursday Guys who are building the General Store in the Historic Village. He gave Ken the OK to charge whatever materials they needed to complete the project on the company’s account at Big C Lumber in Schoolcraft. Ken, of course, was happy to oblige because he desperately needed materials to enclose the exterior before winter. Bronson Hospital, Jaspare’s, and Life Story Funeral Homes have also donated recently to the VCSF’s endowment fund, which Warren Lawrence continually promotes. He loves this way of giving because the money will stay in the fund in perpetuity, with the interest on investments used to provide grants to deserving students. Rettenmaier, although a German headquartered, multi-national company, takes just as much community pride, and writes a check each year for the Schoolcraft Friday Pack that feeds youngsters over the weekend who would go without. Members of the Vicksburg Foundation Board of Trustees from left to right standing: Danna Downing, David Schriemer, Warren Lawrence, Jim Shaw, Didik Soekarmoen. Seated left to right: Lloyd Appell, Chairman Bill Oswalt, and Rudy Callen. It doesn’t end with just giving dollars, it’s the human factor that makes the difference. Volunteers get things done whether behind the scenes or out in front. It would be impossible to name all the volunteerism that goes on in these two villages, but the Eagles Nest folks stand out in Schoolcraft, and the South County Community Services volunteers that serve both communities set the pace. Pictured doing their knitting from left to right: Margaret Lutz, Tanya DeLong, Amy Miller, Mary Ruple, Nora Bednarz, and Chris Knapper. 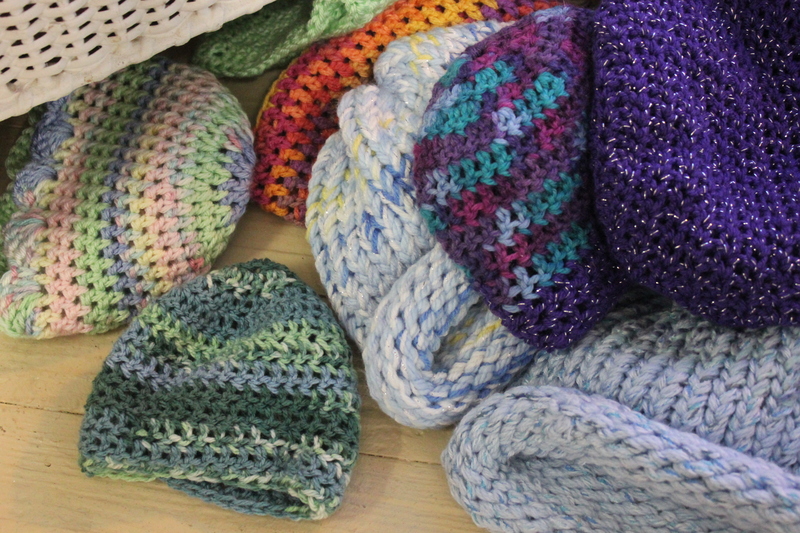 Lots of cancer patients in Bronson Hospital and its oncology hematology center’s children’s department will be warm and cozy with hats knit by Tanya DeLong’s Girl Garage knitters who donated 238 knit caps to the cause this winter. Pictured doing their knitting from left to right: Margaret Lutz, Tanya DeLong, Amy Miller, Mary Ruple, Nora Bednarz, and Chris Knapper. Lots of cancer patients in Bronson Hospital and its oncology hematology center’s children’s department will be warm and cozy with hats knit by Tanya DeLong’s Girl Garage knitters who donated 238 knit caps to the cause this winter. “The patients received them last week and were thrilled. 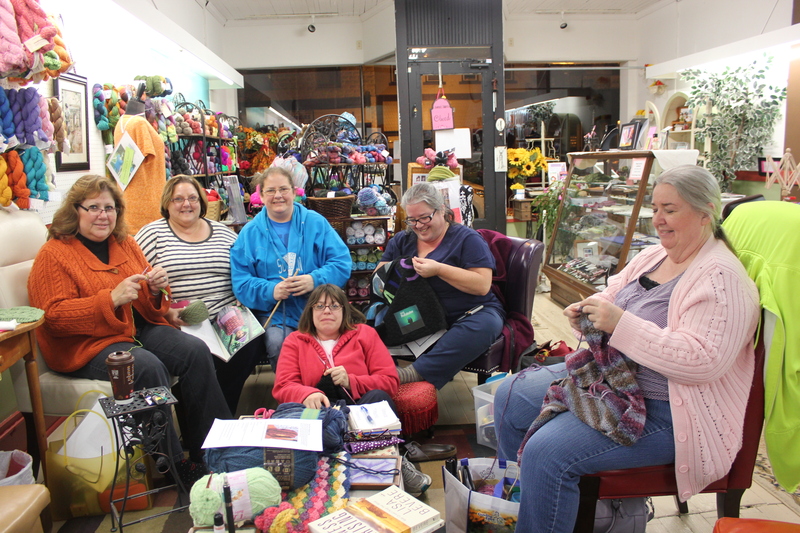 People from Parchment to Constantine and Mattawan to Scotts, as well as knitters in the village of Vicksburg, saw signs in the store window and just kept filling it up with great designs and colors,” DeLong said. Pictured from left to right: Caroline Schroeder, marketing coordinator; Lisa Platte, employee organizer of the campaign; Becky Orfin, Thorsten Willmann, general manager; employees James Commissaris, and Paula Rumsey. General Manager Thorsten Willmann, of the J. Rettenmaier plant on US 131 just north of Schoolcraft, presented a check to Becky Orfin, the new leader of the Schoolcraft Friday Pack program that feeds kids who might go home hungry over the weekend. The employees of J. Rettenmaier in Schoolcraft have conducted a food and money drive for the Friday Pack program run out of the Eagles Nest. 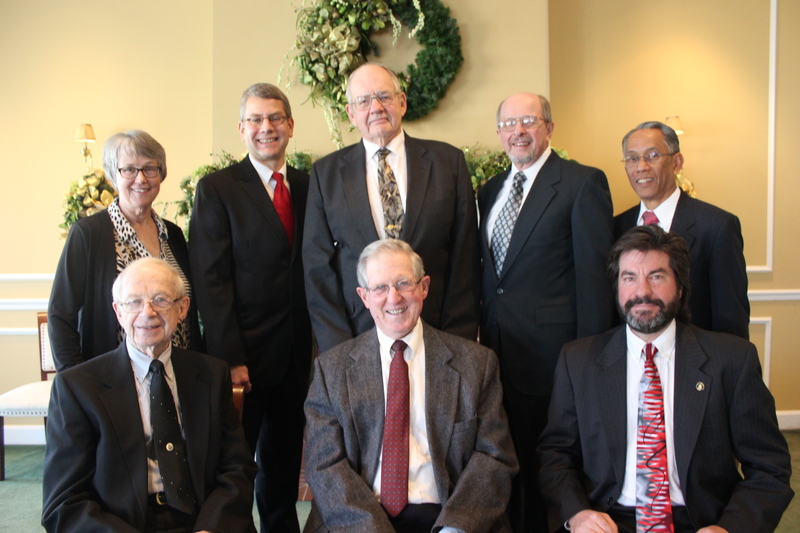 Their generosity has supported Schoolcraft school children for the last four years. 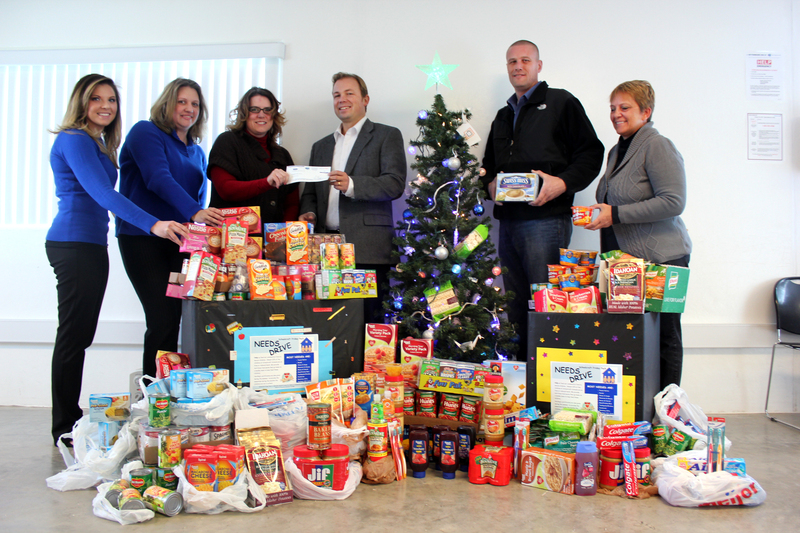 Nearly $5,000 in contributions along with packaged food from the employees and the company has been collected in 2014. The Friday Pack members also actively adopt needy kids and their families to gift them at Christmas time, Orfin said. Rettenmaier also has plants in Portage and Iowa from which generous donations were collected for the Schoolcraft Pack program, according to Platte. The large amount of money brought tears to Becky Orfin’s eyes as she was offered the check from Willmann on behalf of the company and its employees. 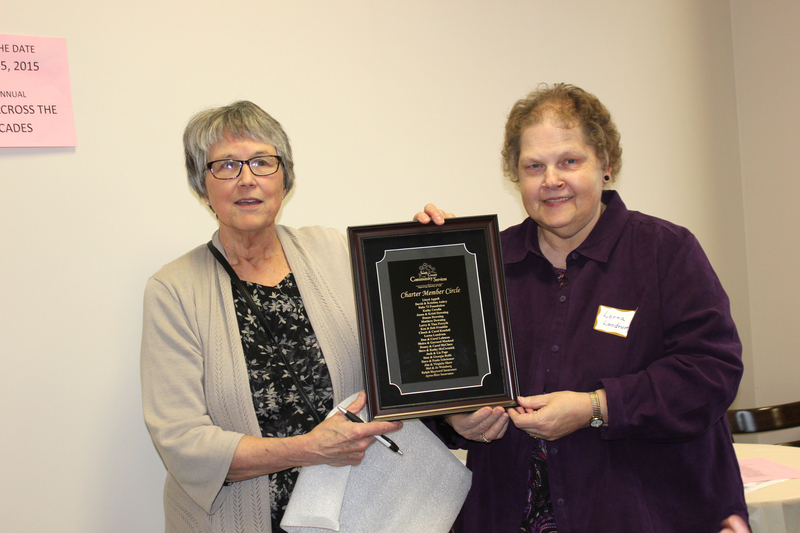 Danna Downing and Lorna Landrum hold up the plaque that was unveiled at the SCCS open house. It lists the Charter Members who donated funds to help start an endowment for SCCS. Important changes have taken place at South County Community Services (SCCS) in 2014 and Danna Downing, the executive director, listed a few of them for the Vicksburg Village Council as part of her yearly report to the general public. The budget for SCCs was dramatically affected by reduced funding for the next three-year cycle from the United Way of the Battle Creek and Kalamazoo County Region (UWBCKR). “Fortunately,” Downing said, “the Vicksburg United Way allocation stayed steady.” In its plan submitted to UWBCKR, SCCS committed to using the money received from the parent United Way to provide emergency assistance to the 25,000 residents in its service area. The monies committed from the local United Way drive have been targeted toward increased community outreach. “The face of need has not diminished,” she told the council. She cited statistics about the working poor with 24 percent of the population in this area, and 17 percent more actually living below the poverty line. “That is why our food Pantry is now open four days a week, Monday through Thursday, so folks can stretch their money to take care of other basic needs. Persons interested in using the SCCS Pantry can simply make a call to Loaves & Fishes at 343-3663 on the morning they need some help putting food on the table. In the 2014 strategic planning process the SCCS board committed to addressing facility issues at 101 S. Main and to create a more sustainable operational platform for the agency. Ultimately this led to far-reaching research about a possible re-location. When the announcement of reduced funding came this summer, it was clear something needed to be done sooner rather than later. As a result, the board decided to take advantage of a more affordable and accessible location at 105 S. Kalamazoo. In addition, a four-day work week plan was implemented in September. Together, these actions have reduced overhead costs significantly for the first six month of the three-year funding cycle. The SCCS board firmly believes that improving awareness and support in the community and further developing partnerships with other agencies are critical to long-term success. Re-thinking the use of available resources and developing new funding strategies are also part of the strategic plan. “Our new membership program and streamlined operations that meet community needs, combined with continued strong local support, should get us where we need to go,” Downing concluded. 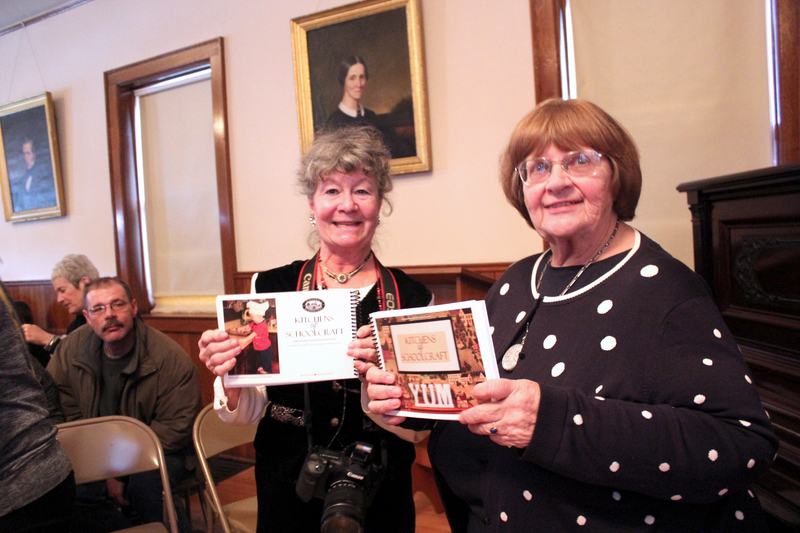 Elizabeth Hamilton and Harriett Swartz, display their book entitled the Kitchens of Schoolcraft. It was a volunteer effort by these two ladies, along with those whose kitchens and recipes are featured. The book is available for purchase at the Schoolcraft library for $15. With only 250 printed, they are going fast.